"Well, the rich certainly don't pay their fair share of taxes"
Keep in mind as you look at this that the top 1% don't earn 39% of the country's income -- it's in the low 20% range; and same for the entire top quintile -- that group doesn't earn 94% of the income. Thus, the unfairness of the claims they don't pay their fair share. 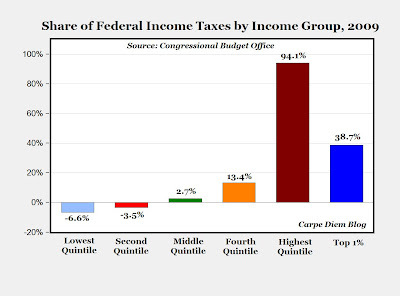 Note, also, that the bottom 40% are actually net tax gainers!! !